BETHLEHEM (Ma’an) — A UN official on Friday condemned in the strongest terms the brutal “extrajudicial execution” of a wounded Palestinian by an Israeli soldier that was captured on camera in Hebron the day before. 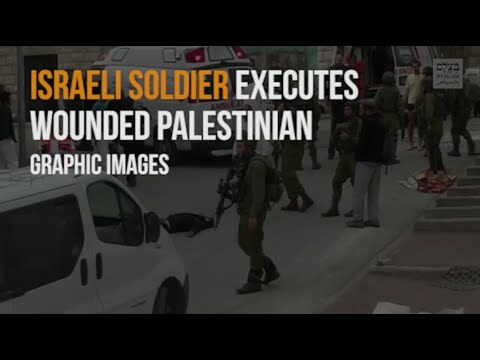 Special Coordinator for the Middle East Peace Process Nickolay Mladenov said he strongly condemned the apparent “extrajudicial execution” of the Palestinian, who was shot in the head at point-blank range despite having already been shot to the ground, where he lay wounded for several minutes, after allegedly stabbing an Israeli soldier. “This was a gruesome, immoral, and unjust act that can only fuel more violence and escalate an already volatile situation,” Mladenov said. He welcomed the condemnation of the execution by Israel’s Minister of Defense, Moshe Yaalon, and called on the Israeli authorities to “swiftly bring to justice” the Israeli soldier responsible. Israel has repeatedly been accused by rights groups, international leaders, and Palestinian officials of enacting a policy of “extrajudicial executions” against Palestinians since a wave of unrest swept the occupied Palestinian territory and Israel last October. However, the rare video footage of Thursday’s incident — captured by a staff member with Israeli human rights group B’Tselem — brought a barrage of condemnations from the Israeli leadership and led Israel’s army to detain the soldier responsible and launch an investigation. Palestinian residents of Hebron Abed al-Fattah Yusri al-Sharif and Ramzi Aziz al-Qasrawi, both 21 years old, were shot down Thursday after allegedly stabbing and moderately wounding an Israeli soldier near a military checkpoint in Hebron’s Old City. Al-Qasrawi was killed instantly, while the graphic video footage showed al-Sharif lying on the ground for several minutes — moving his head slightly but posing no threat — before an Israeli soldier walked up to him and shot him in the head. The soldier has since claimed he killed al-Sharif out of fear the incapacitated man was going to detonate a suicide bomb vest, according to Israeli media reports. The statements come despite the fact that both officials have been accused by Palestinians and rights groups of incitement against Palestinians and advocating a “shoot-to-kill” policy against Palestinians who carry out attacks. The MK called for Netanyahu to be tried with the soldier responsible for Thursday’s execution, alongside other Israeli officials responsible for incitement against Palestinians.